It was Tuesday afternoon, and my favorite event at Burning Man. 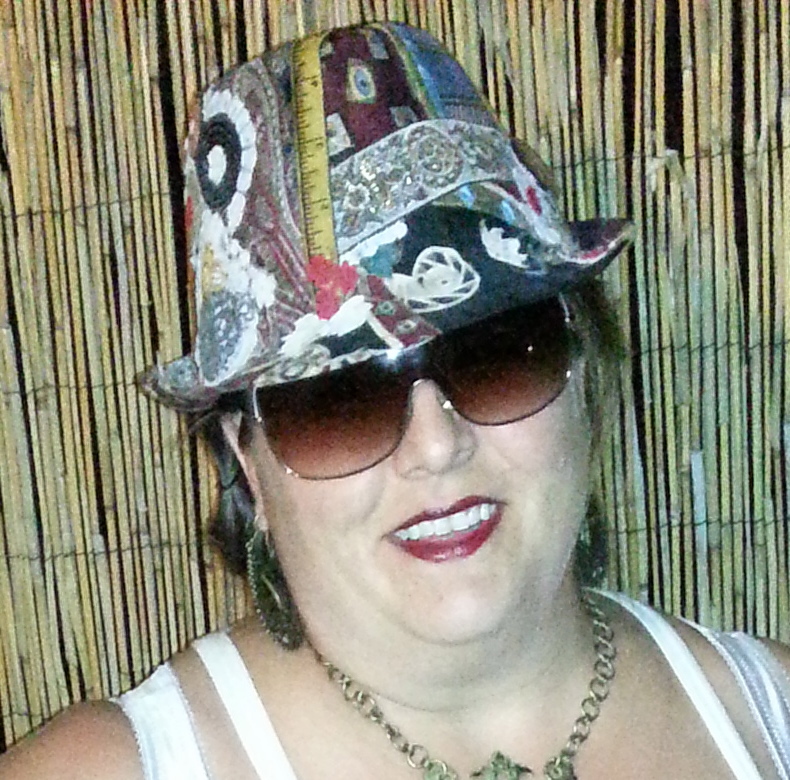 I was at the Cultural Collaborators Party hosted by Burning Man Project, I am their Social Media Coordinator. It is very sumptuous (the ice cream made using liquid nitrogen, was the best I had ever had) and I was standing talking to someone and I heard in my ear “Aren’t you Affinity? I read your blog!”. Well, there are few words that make me happier than hearing that someone is actually reading my blog, and I turned and there stood this fabulous person, Marzy. We chatted, had our picture taken but never received a copy, so she sent me this “In the City” version of her outfit with a description. Here is the recreation of the outfit I was wearing at Burning Man. My necklace was made by me (a brass escutcheon from an old dresser). My hat, made by ME, of silk ties, lace, ribbons, etc. My “corset” is a Frederick’s of Hollywood thrift store find that started out white, but then I dyed it black and the different panels took on the dye differently. It turned out gray & brown. The ruffled wifebeater underneath is another creation by me. What started as a plain white tank top ended up with vintage satin/lace ruffles from a thrift store robe and an antique-ish brass button cluster. The black crinoline was a $5 thrift store find. My boots were, yes, another thrift store find, and still covered in playa dust! After writing all of this down, I realize what fun I have customizing plain old clothes into something fabulous! May this serve as inspiration to all to not accept the plain boring clothes put on the racks in our size! Make a leap of faith and go out and turn the ordinary extraordinary! I have included a close up of her hat so you could see that she has taken elements of various ties to decorate her hat. I have not seen this kind of assemblage before and I love it. Marzy, what a delight to meet you and you look gorgeous in your photo, thanks for making the effort to say Hello and send the photo! I love DIY so it is all just perfect. 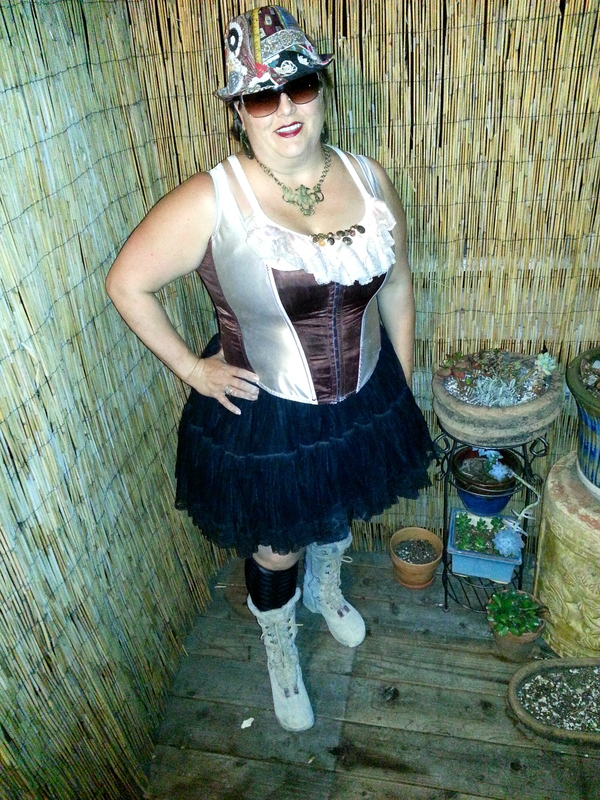 This entry was posted in Burning Man Plus Size, Our Guests, Plus size DIY Size 28 and tagged affinity mingle plus size blog by affatshionista. Bookmark the permalink. Isn’t it fabulous, Sister! Love you and talk to you soon!